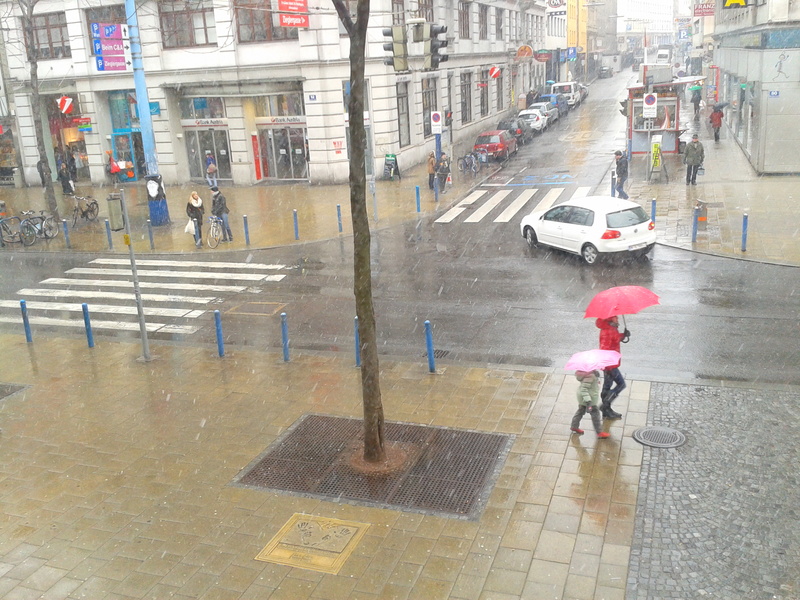 They say the weather makes the Viennese grumpy. I’ve been told that autumn can be a pretty dismal time when a deep fog descends over Vienna and hangs for weeks at a time. That is certainly true of last autumn when, for a whole month, each morning started the same as the one before and never varied its shade of grey. It had a heavy presence, like it was breathing. I actually quite liked it. Being from the UK, I am used to a grey sky, rain and cold. I have also lived in a perpetually sunny place called The UAE where the sun made me miserable, at times. It was always goading me into being in a good mood, trying to antagonise me into being happy and scorching me as punishment when I wasn’t. I often longed for a nice grey day. With a nice grey sky, you can simply be. You can be serene, calm and still. You can stay in the same mood that you woke up in and enjoy your bad mood if you’re in one. You can be quiet and contemplative. You can stay in all day drinking tea and dunking biscuits. No one expects anything of anyone when there is a grey sky, whereas when it’s bright there’s social pressure to be annoyingly jolly. Reactions to the weather really depend on what people are used to. A Saudi Arabian student of mine couldn’t get out of bed last autumn, let alone think or concentrate. Like Superman, he is powered by the sun. I get energy from a spot of rain. But the Viennese must be used to foggy autumns and changeable skies, so it doesn’t really explain why bad weather equals a bad mood. It’s been alleged that it is the Viennese temperament to be grumpy and so they need little excuse. I teach a lot of people who grew up in different regions of Austria and one diplomatically said she finds the Viennese very creative in their ability to find so much to complain about. In reply, the Viennese student defended his inherent right to moan about anything and everything, admitting it was a favourite pastime of his. He was proud that the people of Vienna are all so skilled in the art of complaining. Someone else once asked me how I coped having to teach the Viennese with their melancholia. In truth, I don’t find them to be miserable. If being happy is a positive number and being grumpy is a negative number then Viennese people hover around zero, neither happy nor sad, which is an excellent place to be; it has balance. Today, after having a whole week of what appeared to be the start of spring, it is snowing again. But because the snow is mixed with rain the sky is dark and the atmosphere is a little depressed. 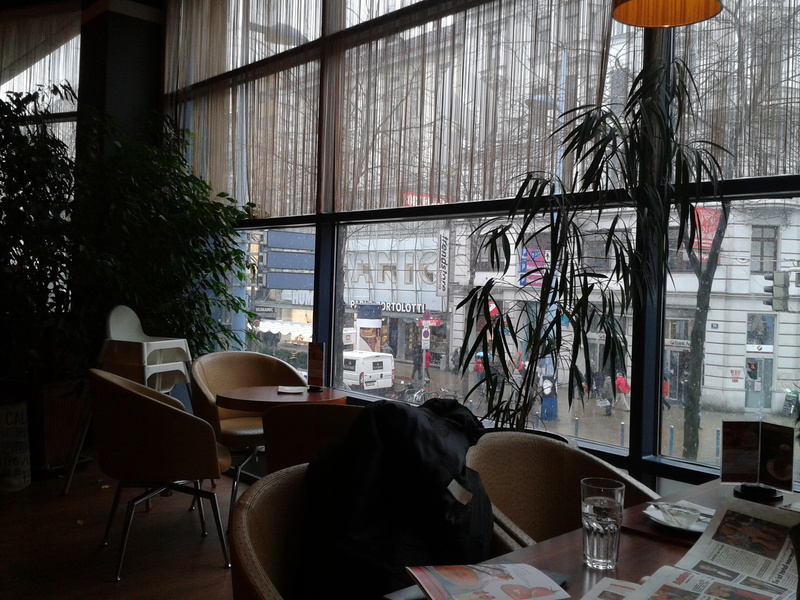 The others around me in the café do look a little glum and pensive. There is a lot of gazing outside the window going on. 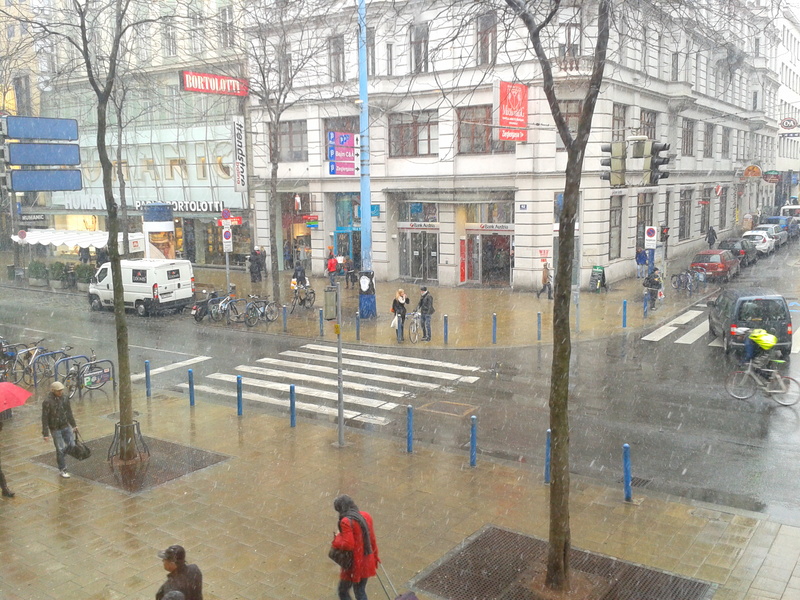 All are silently watching the snow falling on the hooded figures on Mariahilfer Strasse, which is quieter than usual. The people in here mustn’t be true Viennese because if they were, I suspect they’d be feeling very content, happy to have something to grumble about.